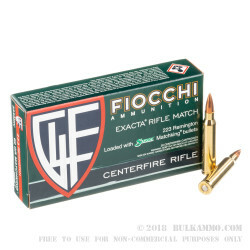 These match-grade .223 cartridges from Fiocchi are a great way to proof your new AR build's accuracy or to sight in a scope reticle without any guesswork attributed to poor ammunition performance. 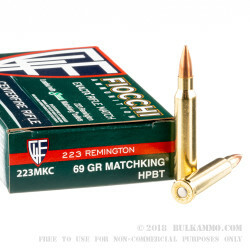 Fiocchi makes this ammo using 69-grain HPBT (hollow point boat tail) from Sierra's MatchKing line; these particular bullets are known by name around the world due to their balanced lead cores, uniform copper jackets, and distinctive rear taper. Those features are achieved by using a lead-feeding method which leaves the jacket undisturbed and ensures that each round has consistent dimensions and weight. As a result, the rounds are incredibly precise at long distances and shrug off drag in-flight. The 69-grain weight is best used in fast barrel twist rates of 1:8 or greater. 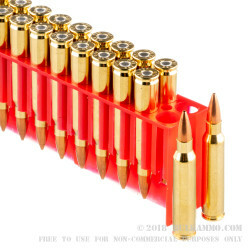 Fiocchi crimps each bullet into a brass casing that has been heat-treated just below the neck for proper flexibility that translates to long reloadable life. Each casing is filled with high-energy propellant that has been painstakingly matched to the load and fitted with a non-corrosive Boxer primer that provides dependable ignition when struck. 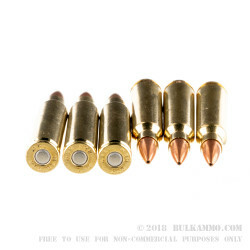 That makes this .223 Remington ammunition perfect for competitive match use.